Short film ‘That’s Opportunity Knocking‘ has been making waves on the festival circuit, winning awards and receiving praise from fans and critics alike. 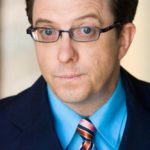 We were lucky enough to sit down and chat with two of the masterminds behind the comedy, writer and director Charles Pelletier, and actor C. Stephen Foster who plays Wally. Hi guys, it’s fantastic to finally sit down and chat. Can you tell our readers a little bit about yourselves and how you got into filmmaking and acting? CP: I have directed a lot of things on the stage, and actually a lot of musicals. I have a musical background, it’s much easier to fill audiences for musicals than it is for plays. So I’ve done a lot of that, both directing and on stage. But I’ve also been in Los Angeles for 20 years and I’ve been involved in all aspects of the film industry. So taking stage direction and applying it to film just made sense. CSF: Charles and I did theater in Los Angeles for many years and had success with “The Green Room” and “Legends and Bridge” but always TRULY wanted to make films. We had written many screenplays, TV show scripts that got acclaim, won a number of screenplay contests, but never sold. 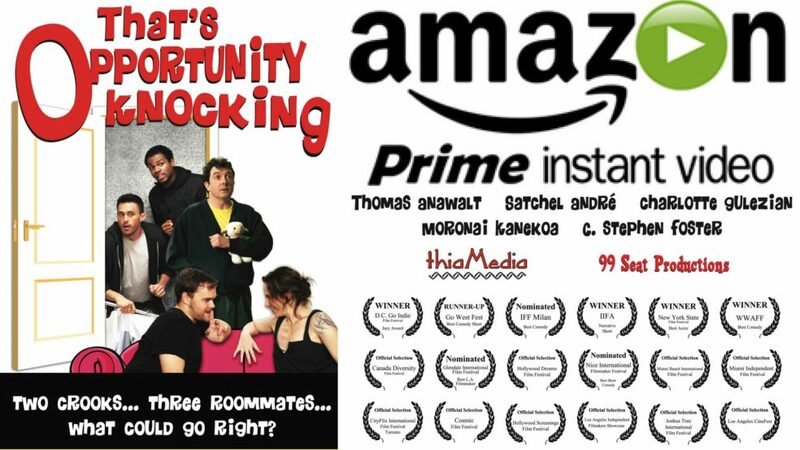 So, after having gone to film festivals as an actor in “Hidden Hills” and “The David Whiting Story“, we decided to create our own short film, “That’s Opportunity Knocking“. So you have both been in and around the business for a long time. Have you always wanted to work in the film industry? CP: Yes. When I came to Los Angeles, I did background work in films and television, and caught the bug. I worked briefly as an assistant agent, and then at Republic Pictures, where I met Liz Gulick, who designed our poster. I worked for Spelling and then Deluxe Films before going back to stage work. CSF: I think that’s why we both came to Hollywood to begin with, but we learned our craft in 99 seat theater. That’s why we called our production company 99 Seat Productions. Ah, so that is the where you got the name from. What was the idea behind That’s Opportunity Knocking? CSF: Well, it’s a long story told by actor Thomas Anawalt who works at the Happy Hammer. It is a unique story that’s for sure, and it does make a terrific short! How did you find making the short? CSF: Working with Charles and the cast was EXTREMELY easy. We had all recently worked together in that play “Seven Dreams of Falling” at the Hollywood Fringe Festival, so it was like “The Carol Burnett Show”. Everyone was extremely gifted, talented and generous. CP: It was fantastic. The crew that Cynthia Webster had assembled was an amazing set of professionals, with a fantastic amount of collective experience. We were trying to come up with solutions for some very difficult shots: the shower curtain falling, the filming of the gentleman in the bathtub, and so on. Daryl Hoss, our production designer, worked several miracles. You managed to do a great job with the film. It seems like you all had a great time making the short and that chemistry comes across really well on screen. What has your experiences been like at festivals and screening the short? CP: There is a camaraderie that is unparalleled in the artistic world. I think it’s because each of us generally works in a very specific genre. So when I start talking shop to someone who directs horror films, or action films, there is no competition whatsoever. We can learn from each other, but we truly want nothing but success for each other. And that’s even true within the genre. It’s hard to be an independent filmmaker, so we all have to be on each other’s side. CSF: Extremely rewarding and fun! I’ve loved film festivals since I went to my first one Palm Springs International Film Festival. We’ve met some incredibly talented folks at LAIFFA and GOWest and even looking forward and networking online everyone at Action on Film, Go Independent, JTIFF, GIFF, & Kapow are extremely supportive! We find a collaborative environment at film festivals. A lot of love and support which you don’t get when you are pounding out scripts in the midnight hour in your hovel and then the labor of attempting to sell them! We agree the atmosphere and support at film festivals is fantastic, it’s more like one big celebration of film rather than a competition. They are a great place to be. Have you been surprised by the great reception the short has received at festivals? CSF: Yes! We thought it would take six months or so to get started, but almost as soon as we submitted, we got into LAIFFA and GoWest and Joshua Tree right in a row, so we had to do some major footwork to get ourselves ready for them like website, postcards, contact lists, twitter/FB. We started to win awards which is rewarding. On a side note, Charles and I LOVE National Parks, our coffee table is piled with books about them, and we’ve screened at Yosemite and Joshua Tree is coming up! CP: People have been amazingly supportive. As many have said, when you put out a piece of art, it’s like having a baby. You’re just so proud, and you want everyone to see it. Do you have any actors or filmmakers you look up to or take inspiration from? CP: I love Buck Henry, Milos Forman, Quentin Tarantino. For actors, there are so many: Eddie Murphy, Peter O’Toole, Bradley Cooper, Katherine Hepburn. There are so many. Peter O’Toole , great choice, Sunderland’s most famous fan! CSF: I have a list a mile long: Carol Burnett, Gilda Radner, Woody Allen, Buster Keaton, Bette Midler, Christopher Guest…comedic geniuses. You both have some really influential people there! Is comedy your favourite genre? CP: Absolutely. My mother had this thing when she got older… She would only watch comedies. I asked her why, and she said, “Because everything else puts me in a bad mood.” I want to put people in a good mood. That is pretty good reasoning! 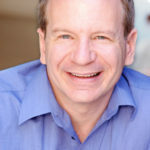 CSF: I’m 5 feet tall and have a funny voice so comedy is “natural” to me. I tend to think in very “warped” terms anyway. I think it was from the incubator I was put in when I was born 3 months premature. They fed me laughing gas! Have you got any upcoming projects you can tell us about? CP: Everything is still in the cooker. Nothing I want to spill the beans on right now. That sounds exciting. We will be looking forward to hearing more about those projects in the future. CSF: Well, if the world don’t destroy itself, we hope more festivals, meeting more awesome people and more films! I also have a few indie films coming out later this year. Have you got any advice you can give our readers? CP: Find people that you love to work with, and keep working with them. That’s great! Thanks guys it has been our pleasure. Good luck with the festivals. I have a feeling ‘That’s Opportunity Knocking’ is going to do extremely well and I wouldn’t be surprised if a lot more awards are on the way!